So it’s done and the result is better than I ever expected – perhaps there is a runner inside me after all. Whilst my specific training was not very long, I believe my strategy was pretty spot on. Prioritise distance and try to maintain some speed would be a good sound bite for the approach. I tapered well and was feeling very fresh on marathon morning. I wrote a blog entry the night before with my predictions. I firmly believed that 3:07 was the most likely outcome. Even with this prediction in mind, I didn’t actually have a plan for race day outside of: let’s see how much I am able to suffer today. I made my way up to the front of the first start group and decided to just run. The gun went off and I did just that. I ran by feel and hardly looked at my watch at all. After two miles of effortless running I glanced at my watch and saw that I was hitting 6:30/mile – suicide pace for sure. I decided that I’d just keep running and see what happens. I hit two bad patches during the first 10km where I didn’t feel smooth. I had to force my running and the paced backed off somewhat during these two periods and the tone for the day was set: feelings of fluid natural running interrupted by some unusual awkward and sluggish patches. I passed the half way point at 1:31:00 with bitter sweet feelings. Firstly, I was way ahead of plan but so close to sub-3 pace that I could taste it. I then adjusted my plan to just hold pace until 14km to go and then give it all I have; this is 4km sooner than I would usually decide to kick. The 14km to go point came and I started to execute my new plan. I had just under an hour to try to make the sub-3 a reality. My quads started to hurt very soon after my kick began. Pain management became an exercise in denial: “my legs aren’t sore, they are nice and warm” became my phrase of denial for about five or six kilometres. With 5km to go all such mind games were futile – I simply started to estimate the amount of minutes remaining and dismiss them as being ‘no time at all’. Three kilometres to go was the point at which I nearly gave up… the rational argument in my mind almost beat the urge to drive myself forward. Thankfully I relented and pushed through to the finish in the most pain I have ever experienced in a race to date. I glanced at the clock to see a time of 3:00:50. For some it would be a disappointment – so close to the sub-3! For me it was a great achievement – having gone so deep into the red for so long was what the day came to mean to me. It’s now two days later and I’m still proud of what I did; In this case, the effort was more important than the result. Now to see what I can do with 26 weeks prep. Dublin City Marathon is starting in just under eleven hours. 2:59 is pie in the sky type prediction. I’ll know in 15 hours. I was very surprised with this. I just went out and decided to run by feel. No looking at the watch at all and I planned to turn around when I felt like it. The result abover speaks for iself. I’m pretty happy with the form that was shown today. Now 5 days remaining to see what that gives in the marathon. I’m very tired today; didn’t expect to be this fatigued after the long run. Perhaps a four day gap between long runs is not enough. Today I will be mostly doing nothing physical. Five o’clock start and no food since lunch took it’s toll. The data paints a pretty good picture: a nice long leisurely run. The subjective data is different. It felt fast and easy until kilometre 25, that’s most likely when I ran out of glycogen. It was a struggle from that point on. The positive thing is that I wanted to experience some pain and suffering before the marathon – done! Check out the top right hand side of this web page. I’ve entered Stockholm Marathon 2012. My crash training plan for Dublin marathon has wet my appetite. I want to have a go at a new PB next year. June 1st is the date. Done deal. Today’s run was in torrential rain. Pretty happy with the run. Not too difficult at all. The take home fact is that I now only need one day’s recovery after the long run. Two weeks ago I was still feeling the effects after three days. This is progress. Breakfast eaten, time for this weeks long run. Feeling good now – let’s see how two and a half hours of running effects that. Nice run. Sunny day. Feeling a little stiff now. I’ll write more later. It’s now later. I’m tired but I feel that I am well able to manage a 32km run now. 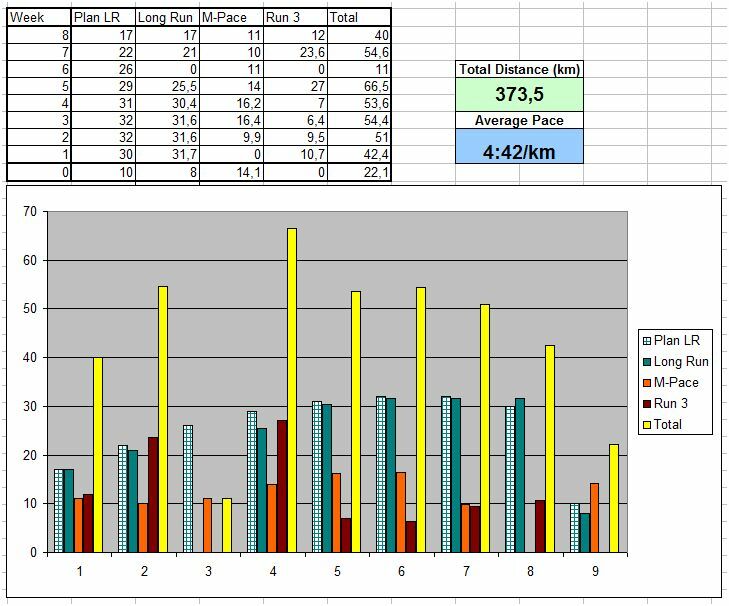 Only 5 weeks training and my distance has gone from 12km to 32… Impressive. The down side -there always is one- is that while I may be able for 32, or even 42km, my speed has evaporated into thin air. I was feeling pretty comfortable throughout the entire run today and with 8km to go I thought I’d up the pace and see what happened. 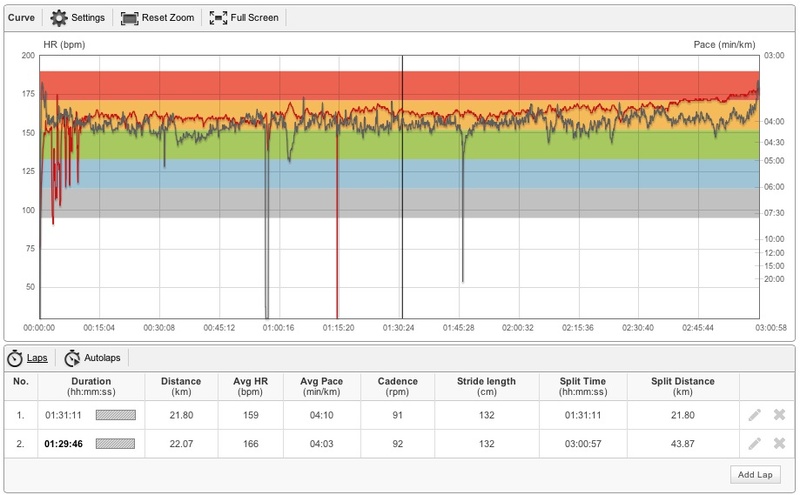 The result: my heart rate went up 10 bpm, my speed increased by 2 seconds/km! This is not what I was hoping for. Next week should be all about addressing this lack of speed. I’ll call it Speed week. It’ll inclue a set of Yasso 800s, the M-Paced run (16+ km) and the treadmill hill session. It was very difficult to motivate myself to step out the door tonight. Not as long as I wanted but infinitely better than the zero It was looking very likely to be. Job done. Long run planned for 8:30 Saturday morning. Around 31km will do the trick. 4:45/km would be nice. Recovery has been great after Sunday’s long run. Only one day off and I already feel like killing it. Just to be on the safe side I’ll hit the treadmill and do hill nitervals. 14,2km/h for the duration with 1:30 @ 6,5% incline. I’ll decide on the RI and total duration when I get to the gym. ‘Going to be fun. 10:00 w/u – 14,2km/h and leave it there.